Eric Fischer’s Geotagger’s World Atlas” series showed where photographic hotspots in various world cities were, using Flickr geotags. His Local and Tourists visualizations attempt to breakdown the photos into tourists and locals — blue is locals (people who have taken photos in the same city for more than a month), red is tourists, and yellow is indeterminate. People are using Flickr notes to explain popular photos ops. GTWA was ordered by number of geotagged photos taken, and Chicago was on that list. 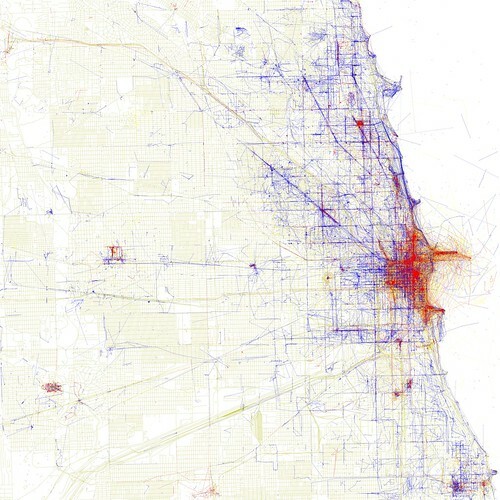 The Locals and Tourists maps are ordered by number of photos and Chicago shoots to there. It’s money, of course, and it’s sad for the grand experiment that was the Metblogs network. The Chicago Metblog has been pretty dormant since last summer, so we’re not really going to be missed all that much, but there are 57 cities in the whole network and many of them are pretty active. Just not, I guess, active enough in a paying-for-the-servers sort of way. Chicago was the fourth* city in the Metblogs network and over the last (nearly**) 6 years we’ve had 3,457 posts*** and 7,318 comments. Even with our dormancy over the last year, that still puts us at 6th highest post count in the network. A site redesign/database migration a couple of years ago means we lost a bunch of old author names, so I’ll just say we’ve had a couple dozen over the years and they were all great, whether they posted once or 800 times. You’ve got plenty of choices for local blogging in Chicago these days—Gapers Block, Chicagoist, Windy Citizen, the Chicago Now network… it’ll only be up for a week, so feel free to plug your favorite Chicago blogs in the comments. I’ll see you around the blogosphere. * San Francisco and Washington, DC beat us by a couple of days. ** First post, June 26, 2004. *** 3,458 when I hit save on this. Update: the Metblogs network has been saved. Our friend Beth makes fun and funny pillows under the name Diffraction Fiber (you may have seen her ctrl-alt-delete pillow set on your favorite nerd blog) and we’ve given her state pillows as wedding presents before. So when we trying to come up with a wedding present for our friends Ben and Emily, we thinking about getting them an Illinois pillow, because they both love Chicago (they even had their Chicago-themed apartment featured in a Time Out article). 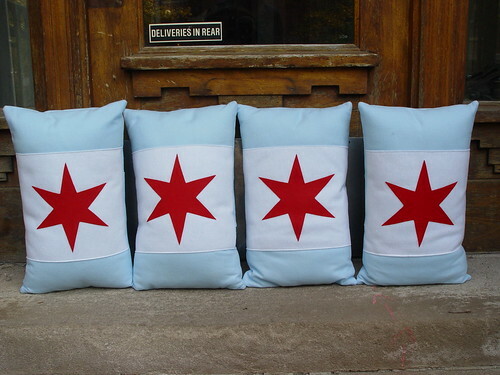 Brainstorm—why not pillows of the Chicago flag? They came out great—we gave two to Ben and Emily and kept two for ourselves (I’m justifying it by telling myself that 4 pillows would be awkward on a couch). Beth says she’s adding them to her repertoire, do they should be available from her Etsy shop. 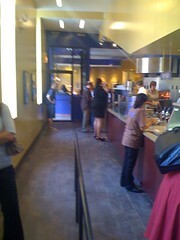 I read about Rick Bayless’ brand new Mexican streetfood(ish) place Xoco yesterday in the Trib and the Decider and my first thought was to wait a few weeks for the lines to die down. But then work got all busy and I didn’t get out of the building to get some lunch until 2:30 and I took the chance that the lunch rush would be over. I was correct. At 3:00 pm there was practically no wait at all — there were just a few people ahead of me in line (two places ahead of me in line was restaurant PRer Ellen Malloy and Rick Bayless came running over to take a picture of her with his iPhone). 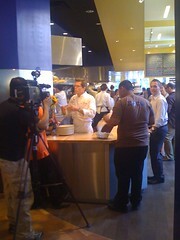 Rick Bayless was very much a presence in the open kitchen of Xoco — snapping photos, clanging around with pots and pans, and doing an interview with a Spanish-language television host (above). I try not to get starstruck, but yeah, he’s a handsome man. For lunch I got a churo, a limonada, and the Torta Cubana. I had meant to save the churo for dessert, but my sandwich took a little while to come (I’ll let it slide—it’s the first week) and so I ate the churo to tide me over. 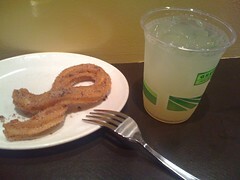 The churo was delightful—sweet, cinnamony, warm, and just the right ratio of crispy and doughy. 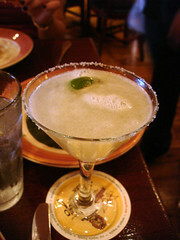 The limonada was similarly delightful — thick with lime flavors and fairly tart. 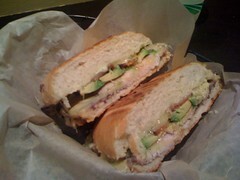 The Cubana sandwich was good, but not the best Cuban sandwich I’ve ever had. Notably, there was no pickle, which I would consider a component that really makes a Cuban sandwich. Not to rag on it too much — it was a good sandwich and the bacon on it was incredible. In retrospect, maybe I shouldn’t have gotten a Cuban sandwich at a Mexican joint. I’ll definitely be back to try some of the other offerings. Xoco is only open for lunch and dinner right now, and they’re not offering takeout (which is a wise choice, given the time it took for my eat-in order). The breakfast offerings already on the menu look incredible and I can’t wait for them to open earlier. 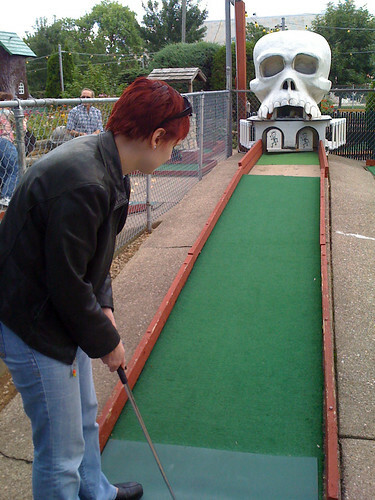 Novelty Golf and Games* in Lincolnwood (3650 West Devon Ave) has everything you’d want from a miniature golf setup: big random sculptures, mechanical rotate-y things (including a windmill), and oddly difficult holes. The Bunny Hutch is right next door and there’s an Oberweis across the street for pre-game hot dogs or post-game ice cream, respectively. There are two 18 hole courses and there’s a second game discount if you just can’t get enough miniature golf. * the “and Games” is batting cages and an arcade. 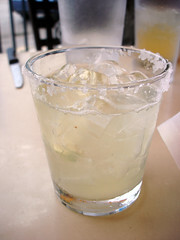 Here was the plan: a Saturday afternoon with nothing important to do, two couples, four places known for margaritas. Each person would order an appetizer and take care of the bill at one restaurant, so that it all evens out. It’s important to be properly fortified before you set out on a journey like this, so we had a sip of Hacienda de Chihuahua Sotol before we took the train south. Hmm… smooooth. 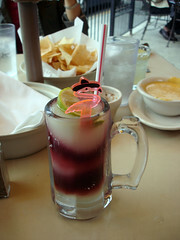 We all were going to mostly stick with traditional (or at least, non-frozen) margaritas, but the Swirl is the signature drink at Uncle Julio’s and I’m a sucker for a signature drink. The florescent flamingo lets you know you’re not in for subtle flavors, but I did enjoy it. Everyone else got the Julio’s Gold margarita on the rocks and we got a bowl of Chile con Queso for the table. Hmmm… cheeeese. At Adobo the signature dish is the Guacamole which is prepared fresh, tableside. (I’m also a sucker for food that’s a show) so that had to be our appetizer. 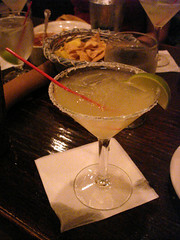 And we had the Adobo Margarita all around. None of us were brave enough to add a “smoky floater” to our Margarita (an extra shot of del Maguey Chichicapa), which in retrospect I regret. I was starting to feel the alcohol by this stop and so I ordered a pomegranate margarita under some sort of mistaken impression that the fruit juice would be healthier or something. 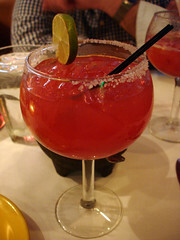 Instead, it was a bit too sweet for my tastes and so it was the only drink I was unable to finish on the tour. We had a plate of Garnachas with ground beef which were tasty, but a small portion for four people. I was back on my game by the time we got to La Fonda. It was my turn to order the appetizer and I was feeling a bit noshy so we got two kinds of plantains (hmm… plantains) — the Tostonachos Caribenos and sweet plantains, and some rice and beans. We got the Gold or Special or whatever (I forget their name for their Top Shelf margarita) all around. I think it might have been my favorite of the tour, though that may have been the 4 previous drinks talking. It’s true, I produce this show, but let this video stand as unmistakable evidence of the amazing array of comedians we put onstage week after week. This brief, high-energy clip features all of our current cast members, a few alum, and some of our favorite guests. Got $5 burning a hole in your pocket? Need some comic relief? Come to the Beat Kitchen tonight at 9:30, and we’ll make you forget your troubles. 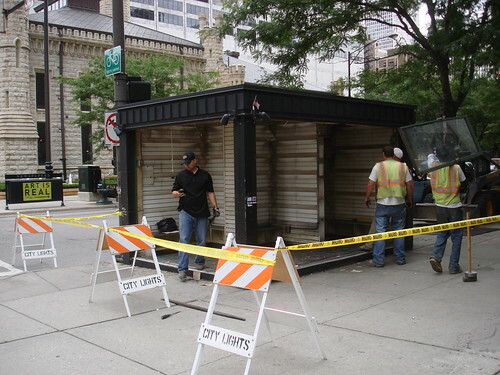 The long-standing 24-hour newsstand at the corner of Chicago and Michigan was dismantled this week. 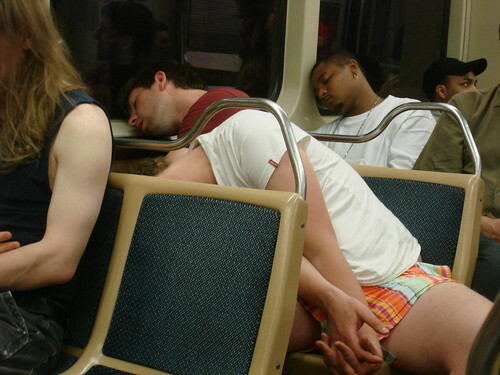 Red Line, Saturday night, just after Midnight. Chicago, it’s April. Please stop punching me in the face. Now that it’s June and the weather is still punching us in the face, over and over, giving us little shoulder jabs, just think how wonderful that one sunny day is going to seem. Whenever it gets here. The new rule around our house is that if one of us says “We should …” and the other person says, “Yes, we should.” then we do our best to just go do that thing. 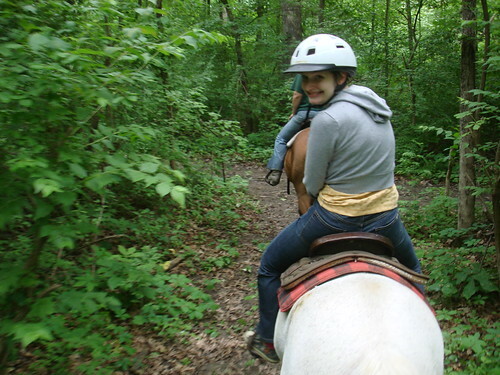 So it was that this last weekend we found ourselves driving down to Kankakee River State Park, about an hour and a half south of where we live in Chicago, and riding horses. It was $25 each for an hour-long guided ride, and it was well worth it. We rode most of the way in quiet, just soaking in the sounds and smells of the woods around us. The State Park Stables are run by Camp Shaw and everyone we dealt with was a peach. Afterwards we had a beer and lunch at BrickStone in downtown Borbonnais and it was a great topper to the afternoon. 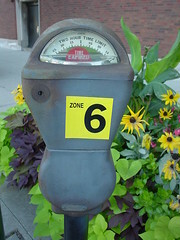 I’m glad the press release is dated March 31, because otherwise I might think this was an April Fools: The City has “suspended the ability of Chicago Parking Meters, LLC (CPM) to issue parking meter violations” until they fix the evidently overwhelming number of broken meters.